A CURE FOR DRUG PRICES? The cost of medications is always an issue for most patients. In an effort to help, we has provided the following patient resources and information in an attempt to help our visitors. What can you do to control drug prices? control any lifestyle conditions such as obesity which may be contributing to your hypertension and/or diabetes and, diet. make sure you actually need a medication and, that it works for you without side­ effects. Many medicines have side effects and as well, are effective in only 75­-80% of patients. ask your doctor to prescribe generics only, if possible. Generics are available for prostate cancer. see if there are any over-­the-­counter (OTC) equivalents that may function as a substitute. shop around, negotiate and compare prices online. Far too many drugs require a prescription and many of these drugs should be available OTC as they are in many parts of the world. You should lobby your congressman to make this happen. Download the Add Coupons and Cashback button for Google Chrome today and start saving! 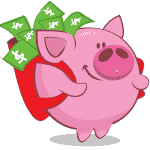 Piggy automatically finds the best coupon codes and cashback at over 1,800 stores! Once you install Piggy, Piggy will go into Snooze mode. However, once you checkout at one of these stores, that’s when all the magic happens and, Piggy automatically springs into action to pick the best coupons and get you the hottest savings! Piggy also pays Cash Back rewards at 1,800+ stores. All you need to do to earn cash back is log in at www.joinpiggy.com/ and every time you shop at a participating store, eligible purchases will earn cash back. Try it, you won’t be disappointed. Tell your friends to join piggy.